The political status of Kosovo, also known as the Kosovo question (Serbian: Косовско питање/Kosovsko pitanje) is the subject of a long-running political and territorial dispute between the Serbian (and previously, Yugoslav) government and the Kosovar leadership in the Assembly of Kosovo, stemming from the breakup of Yugoslavia (1991-92) and the ensuing Kosovo War (1998–99). In 1999 the administration of the province was handed on an interim basis to the United Nations under the terms of UNSCR 1244 which ended the Kosovo conflict of that year. That resolution reaffirmed the sovereignty of Serbia over Kosovo but required the UN administration to promote the establishment of 'substantial autonomy and self-government' for Kosovo pending a 'final settlement' for negotiation between the parties. On 17 February 2008 representatives of the people of Kosovo, acting outside the UNMIK's PISG framework issued a declaration of independence establishing the Republic of Kosovo. The International Court of Justice ruled that the declaration did not violate international law and argued that the signatory authors represented the broad will of the People of Kosovo, rather than the Assembly of Kosovo under the umbrella of UN resolution 1244. Following the Balkan Wars (1912–13) and the Treaties of London and Bucharest, which led to the Ottoman loss of most of the Balkans, Kosovo was governed as an integral part of the Kingdom of Serbia, while its western part (Metohija) by the Kingdom of Montenegro. Noel Malcolm argues that since the 1903 Serbian constitution was still in force at that time, Kosovo should constitutionally not have become part of Serbia, claiming that the constitution required a Grand National Assembly be held before Serbia could expand its borders, but no such assembly was ever held. [page needed] In 1918 Montenegro was united with Serbia, subsequently forming the Kingdom of Serbs, Croats and Slovenes (KSHS), recognized in 1919 and 1920 at the Paris Peace Conference and the League of Nations and gaining a Constitution in 1921. In 1922 the historical entities were abolished by a state commission and 33 new administrative oblasts (regions) ruled from the center were instituted. In 1926 the border dispute with the Albanian Republic was resolved with most of the Gora region remaining in the Kingdom. In 1929, the Kingdom (renamed formally to "Yugoslavia") was restructured into nine large provinces called banovinas (banates), formalized by a new Constitution in 1931. Their borders were intentionally drawn so that they would not correspond either to boundaries between ethnic groups, or to pre-World War I state borders. Most of Kosovo was allocated to the Zeta Banate and smaller bits to the Moravian and Vardar Banates. The first Constitution of the Federative People's Republic of Yugoslavia (later renamed the Socialist Federal Republic of Yugoslavia, SFRY) established Kosovo-Metohija and the northern region of Vojvodina as autonomous provinces within the People's Republic of Serbia. It also promoted the Vardar region of southern Serbia to the status of a separate republic, the People's Republic of Macedonia. The constitution, adopted on 31 January 1946, stated that "The People's Republic of Serbia includes the autonomous province of Vojvodina and the autonomous Kosovo-Metohijan region." It did not spell out the rights and scope of the autonomous provinces, instead stating that this was a matter to be "determined by the constitution of the [parent] republic." The later Constitution of the SFRY, adopted on 7 April 1963, again provided for republics to "found autonomous provinces in accordance with the constitution in areas with distinctive national characteristics or in areas with other distinguishing features, on the basis of the express will of the population of these area." Within the Socialist Republic of Serbia, "there are the autonomous provinces of Vojvodina and Kosovo and Metohija, established in 1945 by decision of the People's Assembly of the People's Republic of Serbia in accordance with the express will of the population of these areas." The details of the rights and scope of the provinces was, again, reserved to the republics' constitutions. The 1974 Yugoslav Constitution, at the time the world's longest, greatly changed the constitutional setup within Yugoslavia. It increased the autonomy of Kosovo and Vojvodina, and gave both autonomous provinces de facto veto power in the Serbian and Yugoslav parliaments as changes to their status could not be made without the consent of the two Provincial Assemblies. It also granted equal status to the Serbian, Albanian and Turkish languages and alphabets within Kosovo. This created anomalous situation, sometimes said to be unique in world history, in which any of the provinces of Serbia could veto a decision pertaining to entire Serbia, while the parliament of Serbia could not influence decisions of the provincial parliaments. This led to central Serbia, which was not a political unit, being effectively under control of the provinces. The expansion of Kosovo's powers caused considerable discontent among Serbs, and Serbian politicians campaigned for a reversion of status changes. It became a rallying cry for a new generation of Serbian politicians. During the 1980s the moderate Serbian communist politician Ivan Stambolić, who became President of Serbia, urged the other republics to agree to a reduction in provincial autonomy. Stambolić managed to win over the League of Communists of Yugoslavia (SKJ) to his position on this matter at the 13th Congress of the SKJ, held in 1986, and then set up a commission to work out the details of constitutional reforms. However, Stambolić was deposed by his erstwhile protégé Slobodan Milošević in 1987, who had used the issue of Kosovo to boost his political support. The much harder-line Milošević pushed for a tougher policy towards the Kosovo Albanians. On 28 March 1989 he had the Serbian Constitution amended to give the Serbian Assembly exclusive rights to decide on the constitutional structure of the country, overturning the veto right of Kosovo and Vojvodina. According to the ICTY indictment of Milošević, when the proposed amendments were put before the Kosovo Assembly, the majority of the Assembly's members abstained in protest and the vote failed to reach the necessary two-thirds supermajority. The Speaker of the Assembly nonetheless declared that the amendments had passed and they were duly enacted. This however was refuted in court by Vukasin Jokanovic who was the President of the Kosovo Assembly at the time during the trial. He provided the court with a video recording of the vote along with the stenographic notes of the assembly session which clearly showed the assembly members voting in favor of the constitutional amendments by the required majority. The following year, a new Serbian Constitution was enacted that drastically reduced the powers of the autonomous provinces, reserving many formerly autonomous rights to the central authorities in Belgrade. It also changed back the name of Kosovo from the Socialist Autonomous Province of Kosovo to the Autonomous Province of Kosovo and Metohija, returning the province to the status predating the 1970s and using the Serbian name for the western part of the region. The 1990 constitution was strongly resisted by Kosovo's Albanians, who set up a "shadow" government to parallel the official Serb-dominated establishment. The Albanian-dominated Kosovo Assembly passed an unofficial resolution declaring Kosovo an independent entity within Yugoslavia, equivalent in status to the existing republics. A few days later the Kosovo Assembly was formally dissolved by the Serbian parliament on 5 July 1990, all its laws declared invalid and its legislative functions transferred to the Belgrade legislature. 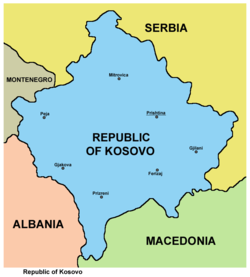 On 22 September 1991, the deposed Albanian members of the Kosovo Assembly met secretly in Pristina to declare Kosovo an independent sovereign state, the "Republic of Kosova". Albania was the only country to recognize the independence. Kosovo independence was also not supported by the international community, which had maintained a consistent policy since 1991 of upholding the existing borders of the individual republics of Yugoslavia. On 10 October 1991 the CSCE (now the Organization for Security and Co-operation in Europe) warned that member states would "never ... recognize any changes of borders, whether external or internal, brought about by force." The United States, the European Community and the Soviet Union issued a joint statement on 18 October 1991 reaffirming these principles. The same set of principles remained the cornerstone of international policy towards the former Yugoslavia throughout the Yugoslav wars. Thus, for instance, the international community insisted on retaining Bosnia and Herzegovina and Croatia as unified states, denying recognition to the breakaway Republika Srpska and Republic of Serbian Krajina. Kosovo's status was a key issue in the political violence that presaged the Kosovo War of 1999. The ethnic Albanian Kosovo Liberation Army was formed after the initial attack of Serbian forces at the kosovarian village of Reçak, where 40 men and boys where executed by Serbian forces. The international community also did not support independence for Kosovo at this stage. The United Nations Security Council passed UN Security Council Resolution 1160 on 31 March 1998 urging the parties to reach a peaceful settlement and rejecting any unilateral attempts to redraw borders, instead "affirming the commitment of all Member States to the sovereignty and territorial integrity of the Federal Republic of Yugoslavia." The same principles were reaffirmed in a high-level meeting during the 1999 NATO bombing campaign, when the G8 foreign ministers adopted a policy of establishing "an interim administration for Kosovo ... under which the people of Kosovo can enjoy substantial autonomy within the Federal Republic of Yugoslavia". On 2 June 1999, a joint Finnish-Russian team headed by former Finnish president Martti Ahtisaari presented a set of proposals to President Milošević. These included a commitment to establish "an interim political framework agreement providing for substantial self-government for Kosovo, taking full account of the Rambouillet accords and the principles of sovereignty and territorial integrity of the Federal Republic of Yugoslavia and the other countries of the region." Under severe pressure from the ongoing NATO bombing, Milošević agreed to withdraw Yugoslav forces from Kosovo and permit the establishment of a UN-led administration in the province, with security to be provided by a NATO-led force (KFOR). Kosovo's constitutional status of the period June 1999-February 2008 was established by the United Nations in UN Security Council Resolution (UNSCR) 1244, adopted on 10 June 1999. The Security Council placed Kosovo under the temporary administration of the United Nations Mission in Kosovo (UNMIK), under the leadership of a Special Representative of the Secretary General. It also explicitly upheld the existing sovereignty of Serbia over Kosovo, "reaffirming the commitment of all Member States to the sovereignty and territorial integrity of the Federal Republic of Yugoslavia and the other States of the region, as set out in the Helsinki Final Act and annex 2 [the Finnish-Russian proposals]." It also established a requirement that the post-conflict status process must take full account of "the principles of sovereignty and territorial integrity of the Federal Republic of Yugoslavia." The reality on the ground was rather different, as Ylber Hysa has noted. Although "Resolution 1244 respects the sovereignty and territorial integrity of the Federal Republic of Yugoslavia, including Kosovo", and even provided for Serbian troops to be stationed in the province, on the ground "certain territories are under the full control of KFOR and the international administration" without any Serbian involvement. However, this part of the resolution was never implemented. The severely circumscribed control exercised by Serbia in Kosovo has led many commentators to describe the nature of its sovereignty as purely "nominal". On 15 May 2001, UNMIK enacted a "Constitutional Framework for Provisional Self-Government." Although it provides a constitutional framework, it is not a constitution, and is deliberately nonjudgmental on the question of sovereignty, as UNMIK itself does not have a role in the determination of Kosovo's final status. It defines Kosovo as "an entity under interim international administration" and "an undivided territory". Crucially, Kosovo's own institutions were specifically barred from making any unilateral decisions about the province's status. The Constitutional Framework states that the Provisional Institutions of Self-Government (PISG) "shall not in any way affect or diminish the ultimate authority of the SRSG [Special Representative of the Secretary General] for the implementation of UNSCR 1244". The Kosovo Assembly is in effect prohibited to make any decisions or declarations on the future status of Kosovo  There are no Ministers for Foreign Affairs or Defence as these functions are reserved to the authority of the SRSG. UNMIK eventually approved the creation of Ministries of Justice and Internal Affairs in late 2005, but noted that the establishment of the ministries was not linked to the question of Kosovo's final status. The 2003 Constitution of the newly created state of Serbia and Montenegro officially acknowledged Kosovo's new interim status, describing Serbia and Montenegro as "the state of Montenegro and the state of Serbia which includes the Autonomous Province of Vojvodina and the Autonomous Province of Kosovo and Metohija, the latter currently under international administration in accordance with UN SC resolution 1244." In 2006, Serbia drafted a new constitution that again referred to Kosovo as an integral part of Serbia. Serbia's interference in Kosovo has caused significant problems. UNMIK was given exclusive rights to manage Kosovo's economic affairs and stated its intent in the Constitutional Framework to establish a market economy. Prior to 1999, much of Kosovo's economy had been controlled by the state. All publicly owned enterprises were owned by the Yugoslav government or the Serbian state, both governed from Belgrade. When UNMIK began implementing privatization of assets that it did not own, Serbs with interests in the companies subject to privatization sued first UNMIK and then the UN in New York. Swedish economist Jessica Johnsson claims that the fact that Kosovo is still regarded in law as being part of Serbia, as well as the ongoing political tensions, has caused it significant difficulties in achieving economic development and that its uncertain legal status has prevented it from accessing lending from International Financial Institutions such as the World Bank. United Nations Security Council Resolution 1244, passed in 1999, reaffirmed in its preamble the "commitment of all Member States to the sovereignty and territorial integrity of the Federal Republic of Yugoslavia" and authorised "an international civil presence in Kosovo in order to provide an interim administration for Kosovo under which the people of Kosovo can enjoy substantial autonomy within the Federal Republic of Yugoslavia", i.e. the United Nations Interim Administration Mission in Kosovo (UNMIK), with security provided by a NATO-led Kosovo Force (KFOR). The Resolution also authorised a process to determine Kosovo's final status. Concerning the latter, Annex 1 to the Resolution states that the "political solution to the Kosovo crisis" should take "full account of ... the principles of sovereignty and territorial integrity of the Federal Republic of Yugoslavia". The UN-facilitated Kosovo future status process was led by UN Special Envoy Martti Ahtisaari, former president of Finland; Austrian diplomat Albert Rohan is his deputy. Ahtisaari's office — the UN Office of the Special Envoy for Kosovo (UNOSEK) — is located in Vienna, Austria, and includes liaison staff from NATO, the EU and the United States. Ahtisaari is supported in his efforts by Ambassador Frank G. Wisner, the U.S. Representative to the Kosovo Status Talks. Ahtisaari holds regular meetings with representatives of the Contact Group. The initial status negotiations focused on technical issues important for Kosovo's long-term stability, particularly the rights and protection of Kosovo's minorities (especially the Kosovo Serbs). Ahtisaari brought the parties together for the first direct dialogue in February 2006 to discuss decentralization of local government, which is an important measure to protect Kosovo Serb communities. Subsequent meetings addressed economic issues, property rights, protection of Serbian Orthodox Church heritage and institutional guarantees for the rights of Kosovo's minorities. On 24 July 2006, Ahtisaari brought the parties together in Vienna for the first high-level talks on the status outcome itself. Serbian President Boris Tadić, Prime Minister Vojislav Koštunica, Kosovo President Fatmir Sejdiu and Prime Minister Agim Çeku attended and presented their respective platforms for Kosovo's future status. Ahtisaari later told the press that the meeting resulted in no breakthroughs, but added that the discussion was "frank and candid" and the atmosphere was better than he could have expected. Ahtisaari briefed Contact Group foreign ministers on 20 September 2006, in New York City at a meeting chaired by U.S. Secretary of State Condoleezza Rice. At that meeting, the Contact Group released a press statement that reaffirmed its desire to work towards a negotiated settlement in the course of 2006 and also endorsed Ahtisaari's plans to develop a comprehensive proposal for a status settlement. After consultations with the Contact Group in Vienna on 10 November, Ahtisaari decided to delay sharing his proposal with the parties until after Serbia held parliamentary elections on 21 January 2007. He said he would take his proposal to the parties "without delay" after these elections. On 3 April, Ahtisaari presented to the UN Security Council his final package of proposals, which included a clear recommendation that Kosovo should become independent subject to a period of international supervision. Pristina accepted Ahtisaari's final Settlement, while Belgrade rejected it. Immediately after the proposals became public, the United States and Germany (in its capacity as EU Presidency) issued strong statements of support. The European Union's Parliament also declared its full support to Ahtisaari's plan. Russia, however, called for new rounds of negotiations, possibly with a new special envoy. At least one other member of the Security Council, South Africa, a non-permanent member, has expressed agreement with Russian concerns. On 11 May, European members of the UN Security Council, Germany and the United States circulated a draft UN Security Council resolution that would replace UN Security Council Resolution 1244, endorse Ahtisaari's Settlement and end the UN administration after a transition period of 120 days. The U.S. Permanent Representative to the UN said that the European/U.S. draft had enough support in the Security Council to be adopted unless Russia chooses to use its Security Council veto, which Russia has stated at numerous occasions that it might use unless the resolution is acceptable by both sides. Russia rejected a UN Security Council resolution based on the Ahtisaari Plan. As discussions progressed in the week of 16 July, seemingly with little hope of agreement, EU foreign policy chief Javier Solana was quoted as saying that the European Union would cease supporting efforts to agree a resolution backing the Ahtisaari plan 'within days' if Russian concerns could not be met. Russia had rejected another draft resolution on Monday 16 July which had called for further talks between Serbia and Kosovo Albanians, describing the draft as, 'permeated with the concept of the independence of Kosovo'. British Deputy Head of Mission in New York, Karen Pierce, told reporters on 17 July that a final draft of the resolution would be introduced 'within 36 hours'. According to news service Reuters, Solana had said that a further, four-month period of talks would be conducted under the authority of the Contact Group, though did not discount that a resolution might still be agreed in the coming days. German Chancellor Angela Merkel appeared to support renewed talks between the parties after discussions with Serbian Prime Minister Vojislav Koštunica, 'We are now thinking about whether it would be possible to support a phase of negotiations between Belgrade and Pristina to try once again to find a solution,' Merkel was quoted as saying. The United States, United Kingdom and other European members of the Security Council formally 'discarded' a draft resolution backing Ahtisaari's proposal on 20 July 2007, having failed to secure Russian backing. The UN Secretary-General later endorsed another time-limited round of negotiations led by a U.S./EU/Russian Troika of negotiators. The Troika completed its work on 10 December 2007, without having achieved an agreement between the parties on Kosovo's status. On 22 January 2008 the Parliamentary Assembly of the Council of Europe (PACE) adopted a resolution calling for the continuation of talks on the basis of UNSC Resolution 1244. UN-backed talks on the status of Kosovo, led by UN Special Envoy Martti Ahtisaari, began in February 2006 with the aim of completing them by the end of that year. Whilst progress was made on technical matters, both Kosovo and Serbia remain diametrically opposed on the question of status itself. Prime Minister of Kosovo's Provisional Institutions, Agim Çeku stated that his government would accept nothing less than independence and would not contemplate partition. On the part of Serbia, Prime Minister Vojislav Koštunica stated Serbia would give Kosovo full autonomy but could not accept independence. The position of the Contact Group of leading nations is that Kosovo "must remain multi-ethnic and the settlement must be acceptable to the people of Kosovo. Additionally, there will be no return of Kosovo to the pre-1999 situation, no partition of Kosovo and no union of Kosovo with any other, or part of another, country." While not yet mentioning the word "independence," the draft Settlement included several provisions that were widely interpreted as implying statehood for Kosovo. For example, the draft Settlement would give Kosovo the right to apply for membership in international organizations, create a Kosovo Security Force and adopt national symbols. Ahtisaari said that after a period of consultations with the parties he would finalize his Settlement proposal for submission to the UN Security Council and at that stage he would also elaborate on the status issue itself. In February 2007, Ahtisaari delivered a draft status settlement proposal to leaders in Belgrade and Pristina, the basis for a draft UN Security Council Resolution which proposes 'supervised independence' for the province. As of early July 2007 the draft resolution, which is backed by the United States, United Kingdom and other European members of the Security Council, had been rewritten four times to try to accommodate Russian concerns that such a resolution would undermine the principle of state sovereignty. The United States called the proposal "fair and balanced," while the EU Presidency noted that Ahtisaari's proposals "build on almost twelve months of direct talks between Belgrade and Pristina." Russia, which holds a veto in the Security Council as one of five permanent members, stated that it will not support any resolution which is not acceptable to both Belgrade and Pristina. In Belgrade, Serbian Prime Minister Vojislav Koštunica refused to receive Ahtisaari. Koštunica claimed that because Serbia had still not formed a new government after the January 21 parliamentary elections he had no mandate to discuss Kosovo and therefore could not meet Ahtisaari. Nevertheless, he later denounced the proposal as "illegitimate and unacceptable" because he alleged it "violates the U.N. Charter ... by undermining sovereignty of U.N. member Serbia." President Boris Tadić did receive Ahtisaari, after which he reaffirmed his vow to never accept an independent Kosovo. Foreign Minister Vuk Drašković warned that it was "necessary to avoid an imposed solution that could cause Serbia to become a factor of instability." After many weeks of discussions at the UN, the United States, United Kingdom and other European members of the Security Council formally 'discarded' a draft resolution backing Ahtisaari's proposal on 20 July 2007, having failed to secure Russian backing. Kosovo Albanian leaders reacted by proposing unilateral independence for 28 November 2007, though the UN would be required to overrule any such action. [not in citation given] In November 2008, the EU accepted the demand of Serbia not to implement the plan of Ahtisaari through EULEX. A referendum on a proposed draft of the new Serbian constitution was held on 28 October and 29 October 2006 and has resulted in the draft constitution being approved by the Serbian electorate. The constitution is Serbia's first as an independent state since the Kingdom of Serbia's 1903 constitution. Over 6.6 million people were entitled to vote in the national referendum. Kosovo did not vote. During the nearly one-century of Serbian rule in Kosovo, this is the only attempt to legally incorporate Kosovo into Serbia, and it was seen by Albanians as an attempt to prejudge the result of the negotiations. In the preamble to the constitution it states that "Kosovo is an autonomous province of Serbia with significant autonomy". Serbian legal scholars found that this unambiguous statement means it would be unconstitutional for Kosovo to secede from Serbia. In November 2005, the Contact Group countries released a set of "Guiding Principles" for the resolution of Kosovo's status. These principles notably included the requirement that there be no return to the situation prior to 1999 and that there be no change in Kosovo's borders (i.e., no partition of Kosovo) and no union of Kosovo with any neighboring state. The same statement includes a call for all parties to refrain from unilateral steps and reject any form of violence. The Contact Group affirms that the final decision on the status of Kosovo should be endorsed by the UN Security Council. At a January 2006 meeting of foreign ministers, the Contact Group further declared that a settlement "needs, inter alia, to be acceptable to the people of Kosovo" and emphasized the need for the settlement to address the concerns of Kosovo's ethnic minorities. Russian President Vladimir Putin stated in September 2006 that the world must apply the same standards to the separatist Georgian regions of South Ossetia and Abkhazia as it does to the Serbian province of Kosovo, where many are seeking independence. He also added that Russia would not endorse any UN Security Council resolution which it felt compromised these rights. A NATO report on the question of Kosovo's status states that a region may have the right of secession in the case of foreign occupation or if the region is a colony of another nation. The NATO report claims, while mentioning disagreement on the interpretation, that a third condition exists when "a people whose right to internal self-determination has been thoroughly violated by a Government that does not represent the people" and suggests Kosovo qualifies under this condition. It concludes, while there is a case in favor of a right to secession for Kosovo, it rejects the right to secession in cases where regions are open to democratic mechanisms. Despite official UN and Russian disapproval, the US, UK, and France appeared likely to recognize Kosovar independence if it had been declared on 28 November 2007 or on 10 December 2007, the deadline for an agreement between Kosovo and Serbia set by UN Secretary General Ban Ki-moon. In February 2008, Hashim Thaçi said that about 100 countries were ready to immediately recognise Kosovo's independence after declaration. On 17 February 2008, Kosovo declared independence. The Constitutional Court of the Republic of Serbia deemed this act illegal arguing it was not in coordination with the UN Charter, the Constitution of Serbia, the Helsinki Final Act, UN Security Council Resolution 1244 (including the previous resolutions) and the Badinter Commission. On 18 February 2008, the National Assembly of the Republic of Serbia declared Kosovo's declaration of independence as null and void per the suggestion of the Government of the Republic of Serbia. The Constitution of Kosovo was proclaimed on 15 June 2008, and immediately denounced as illegal by Serbia. On 27 March 2008 Serbian Foreign Minister Vuk Jeremić said Serbia would request the International Court of Justice to review the legality of Kosovo's declaration of independence. On 8 October 2008 the UN General Assembly adopted Serbia's resolution requesting the International Court of Justice to assess the legality of Kosovo's declaration of independence. The United Nations General Assembly adopted this proposal on 8 October 2008 with 77 votes in favor, 6 votes against and 74 abstentions. On 22 July 2010 the court ruled that the declaration did not breach international law, because in general international law does not deal with declarations of independence and because in this specific case the declaration was not issued by the Assembly of Kosovo, Provisional Institutions of Self-Government, or any other official body and thus the authors, who named themselves "representatives of the people of Kosovo" were not bound by the Constitutional Framework (promulgated by United Nations Interim Administration Mission in Kosovo (UNMIK)) or by UNSCR1244 that is addressed only to United Nations Member States and organs of the United Nations. Prior to the announcement Hashim Thaçi said there would be no "winners or losers" and that "I expect this to be a correct decision, according to the will of Kosovo's citizens. Kosovo will respect the advisory opinion." For his part, Serbia's President, Boris Tadić, warned that "If the International Court of Justice sets a new principle, it would trigger a process that would create several new countries and destabilise numerous regions in the world." After six months of negotiations between Serbia and Kosovo, led by the European Union a deal was reached on 19 April 2013. In exchange for limited autonomous powers for the Serb north, Serbia agreed not to block Kosovo's path to eventual membership of the EU. ^ "ICJ delivers advisory opinion on the accordance with international law of the unilateral declaration of independence in respect of Kosovo". Peace.ax. Retrieved 28 February 2016. ^ "ACCORDANCE WITH INTERNATIONAL LAW OF THE UNILATERAL DECLARATION OF INDEPENDENCE IN RESPECT OF KOSOVO" (PDF). Icj-cij.org. Archived from the original (PDF) on 23 July 2010. Retrieved 2016-02-28. ^ Malcolm, Noel (1999). Kosovo: A Short History. Harper Perennial. ISBN 978-0-06-097775-7. ^ "The Constitution of the Kingdom of Yugoslavia (1931)". Web.archive.org. Archived from the original on 21 October 2009. Retrieved 15 June 2013. ^ "CONSTITUTION OF THE FEDERATIVE PEOPLE'S REPUBLIC OF YUGOSLAVIA (1946)" (TXT). Worldstatesmen.org. Retrieved 28 February 2016. ^ "CONSTITUTION OF THE SOCIALIST FEDERAL REPUBLIC OF YUGOSLAVIA" (DOC). Worldstatesmen.org. Retrieved 28 February 2016. ^ a b "The Prosecutor of the Tribunal against Slobodan Milosevic et al". United Nations. International Criminal Tribunal for the former Yugoslavia. 16 October 2001. Archived from the original on 28 May 2005. Retrieved 28 February 2016. ^ "Transcript of Vukasin Jokanovic testimony". United Nations. International Criminal Tribunal for the former Yugoslavia. 1 December 2004. Retrieved 28 February 2016. ^ "Statement by the Chairman on the conclusion of the meeting of the G-8 Foreign Ministers held at the Petersberg Centre on 6 May 1999". Nato.int. Retrieved 28 April 2010. ^ "NATO & Kosovo : UN Resolution 1244 (1999) - 10 June 1999". Nato.int. Retrieved 15 June 2013. ^ "UNMIK Establishes Two New PISG Ministries and the Kosovo Judicial Council" (PDF). UNMIK Press Release. 20 December 2005. Archived from the original (PDF document) on 26 June 2008. Retrieved 28 January 2008. ^ "Constitutional Charter of the State Union of Serbia and Montenegro" (PDF). Worldstatesmen.org. Retrieved 28 February 2016. ^ "Europe | Serbian PM plans new Kosovo law". BBC News. 12 September 2006. Retrieved 28 February 2016. ^ a b "United Nations Office of the Special Envoy for Kosovo". UNOSEK. 1 August 2007. Archived from the original on 23 July 2011. Retrieved 28 April 2010. ^ "Appointment of Ambassador Frank G. Wisner As The Special Representative of the Secretary of State to the Kosovo Status Talks Archived 6 October 2017 at the Wayback Machine ", by Condoleezza Rice, Washington, DC, 19 December 2005. ^ a b c d e Negotiations on status of Kosovo still under way ", by Blerta Foniqi-Kabashi, Southeast European Times, Pristina, 15 December 2006. ^ a b "No breakthrough at Kosovo talks ", BBC News, 24 July 2006. ^ "Serbian, Kosovo Albanian talks fail to reach breakthrough on future status Archived 2007-09-30 at the Wayback Machine " Agence France-Presse (AFP), Vienna, 24 July 2006. ^ Kosovo Contact Group Ministerial Statement Archived 13 February 2008 at the Wayback Machine, New York, 20 September 2006. ^ "UN delays report on Kosovo future ", BBC News, 10 November 2006.; Statement by Special Envoy Martti Ahtisaari after consultations with the Contact Group Archived 2006-12-22 at the Wayback Machine, 10 November 2006 (.pdf file). ^ "Kosovo's status - the wheels grind on", The Economist, 6 October 2005. ^ "Negotiations Lean Toward Independence", Der Spiegel, 20 February 2006. ^ "Russia Might Veto Kosovo Independence Proposal - U.S. Likes the Plan". Un.org. Retrieved 28 April 2010. ^ "Russia threatens to veto UN Kosovo resolution - dept. FM". En.rian.ru. 24 April 2007. Retrieved 28 April 2010. ^ "Russia threatens veto over Kosovo". BBC News. 24 April 2007. Retrieved 28 April 2010. ^ "UN Resolution on Kosovo Circulated", AP, 11 May 2007. ^ "/ World - Russia rejects plan for Kosovo". Ft.com. 13 July 2007. Retrieved 28 April 2010. ^ "/ World - EU and US introduce Kosovo resolution". Ft.com. 14 October 2007. Retrieved 28 April 2010. ^ "Kosovo pushes independence after UN action fails". News.yahoo.com. Retrieved 28 April 2010. ^ Parliamentary Assembly of the Council of Europe. Press release: PACE calls for continuation of talks on Kosovo status Archived 2009-05-28 at the Wayback Machine, Strasbourg, 22 January 2008. – Retrieved on 19 June 2009. ^ Parliamentary Assembly of the Council of Europe. Resolution 1595 (2008) Archived 2012-09-16 at the Wayback Machine: Developments as regards the future status of Kosovo. 22 January 2008. – Retrieved on 19 June 2009. ^ "Europe | UN frustrated by Kosovo deadlock". BBC News. 9 October 2006. Retrieved 28 February 2016. ^ Hawton, Nick (1 August 2006). "Europe | Analysis: Kosovo's anxious wait". BBC News. Retrieved 28 February 2016. ^ "Europe | Serbia rejects Kosovo trade-off". BBC News. 31 July 2006. Retrieved 28 February 2016. ^ "UN envoy seeks multi-ethnic, self-governing Kosovo[permanent dead link] ", Agence France-Presse (AFP), Vienna, 2 February 2007. ^ "Ahtisaari press conference Archived 17 January 2016 at the Wayback Machine ", UNOSEK website , New York, 8 February 2007. ^ "Russia reportedly rejects fourth draft resolution on Kosovo status". SETimes.com. 29 June 2007. Retrieved 28 April 2010. ^ Presentation of Kosovo Status Proposal to the Parties Archived 6 October 2017 at the Wayback Machine, Sean McCormack, U.S. Department of State spokesman, Washington, DC, 2 February 2007. ^ EU Presidency Statement on the Kosovo status proposals to be presented today by Martti Ahtisaari in Belgrade and Pristina Archived 2007-02-08 at the Wayback Machine, 2 February 2007. ^ "UN Security Council remains divided on Kosovo". SETimes.com. Retrieved 28 April 2010. ^ "UN Envoy Presents Kosovo Plan, Serbia Quickly Rejects It Archived 2007-02-04 at the Wayback Machine ", by Barry Wood, Voice of America (VOA), Washington, 2 February 2007. ^ "Ahtisaari's proposal unacceptable and illegitimate for Serbia", Government of the Republic of Serbia website, Belgrade, 7 February 2007. ^ "U.N. envoy unveils Kosovo proposal[permanent dead link] ", by Garentina Kraja, Associated Press (AP), Pristina, 2 February 2007. ^ "Serbian leaders warn UN plan for Kosovo could destabilize Balkans", International Herald Tribune, Belgrade, 7 February 2007. ^ BalkanInsight.com (7 November 2008). "EU accepts Belgrade's conditions for EULEX". Sofiaecho.com. Retrieved 28 April 2010. ^ "Serbia backs draft constitution". BBC. 30 October 2006. Retrieved 30 October 2006. ^ "Compromise by way of "One Country-Two Systems" formula". Mfa.gov.rs. Retrieved 28 April 2010. ^ "RTHK". RTHK. 29 June 2006. Retrieved 28 April 2010. ^ AFP (6 November 2007). "Kosovo rejects Hong Kong model proposed by Serbia". Times of India. Archived from the original on 20 December 2007. Retrieved 28 April 2010. ^ "Serbs accuse UN of violation of law over Kosovo independence ", by Ewen MacAskill, The Guardian (UK), 25 October 2005. ^ "Succeeding in Kosovo ", by Agim Çeku, The Washington Post, 12 December 2006. ^ Guiding principles of the Contact Group for a settlement of the status of Kosovo Archived 2006-12-21 at the Wayback Machine, November 2005 (.pdf file). ^ Contact Group's Guiding Principles for a Settlement of Kosovo's Status Archived 2006-05-06 at the Wayback Machine, November 2005 (.html). ^ "Statement by the Contact Group on the Future of Kosovo Archived 6 October 2017 at the Wayback Machine ", Washington, DC, 31 January 2006. ^ Putin says world should regard Kosovo, separatist Georgian regions on equal footing, Associated Press, 13 September 2006. ^ Koštunica talks to Putin Archived 2007-02-27 at the Wayback Machine B92. 15 January 2007. ^ "The Kosovo Crisis in an International Law Perspective: Self-determination, Territorial Integrity and the NATO Intervention" (PDF). NATO. ^ Simon Tisdall (13 November 2007). "Bosnian nightmare returns to haunt EU". The Guardian. London. Retrieved 28 April 2010. ^ Wood, Nicholas (2 October 2007). "Momentum Seems to Build for an Independent Kosovo". The New York Times. Retrieved 22 May 2010. ^ "Kosovo expects quick recognition by "100 countries"". Reuters. 8 February 2008. Retrieved 14 February 2008. ^ "Decision of the National Assembly of the Republic of Serbia regarding the Confirmation of the Decision of the Government of the Republic of Serbia regarding the Abolition of Illegal Acts of the Provisional Institutions of Self-Government in Kosovo and Metohia in regards to the unilateral Declaration of Independence". Archived from the original on 11 December 2008. Retrieved 7 April 2009. ^ "Newly independent Kosovo's constitution enters force". 15 June 2008. Archived from the original on 20 May 2011. ^ "Serbia to seek World Court opinion about Kosovo's declaration of independence". International Herald Tribune. 27 March 2008. Retrieved 27 March 2008. ^ "UN General Assembly backs Serbia's initiative on Kosovo". SETimes.com. Retrieved 28 April 2010. ^ "UN seeks World Court Kosovo view". BBC. 8 October 2008. Retrieved 8 October 2008. ^ "Accordance with international law of the unilateral declaration of independence in respect of Kosovo". Nspm.rs. Retrieved 24 July 2010. ^ "ICJ rules on Kosovo statehood - Europe". Al Jazeera English. Retrieved 9 November 2012. ^ Vasovic, Aleksandar (19 April 2013). "EU brokers historic Kosovo deal, door opens to Serbia accession". Reuters. Retrieved 15 June 2013. Ker-Lindsay, James. "From autonomy to independence: the evolution of international thinking on Kosovo, 1998–2005." Journal of Balkan and Near Eastern Studies 11.2 (2009): 141-156. Papadimitriou, Dimitris, and Petar Petrov. "Whose Rule, Whose Law? Contested Statehood, External Leverage and the European Union's Rule of Law Mission in Kosovo." JCMS: Journal of Common Market Studies 50.5 (2012): 746-763. Radojičić, Mirjana S. (2015). "Evropska unija i Kosovsko pitanje - međunarodno-etička perspektiva". Zbornik radova Filozofskog fakulteta u Prištini. 45 (1): 167–184. doi:10.5937/zrffp45-7157. Samardžić, Slobodan (2009). Samardžić, Slobodan (ed.). "The Kosovo-Metohija problem from the European integrations angle". Serbia in the European Union Association Process, Službeni glasnik: 193–238.